The 787 is a family of technologically advanced, super-efficient airplanes with new passenger-pleasing features. In addition to bringing big-jet ranges to midsize airplanes, the 787 uses 20 percent less fuel and creates 20 percent fewer emissions than the airplanes it replaces. 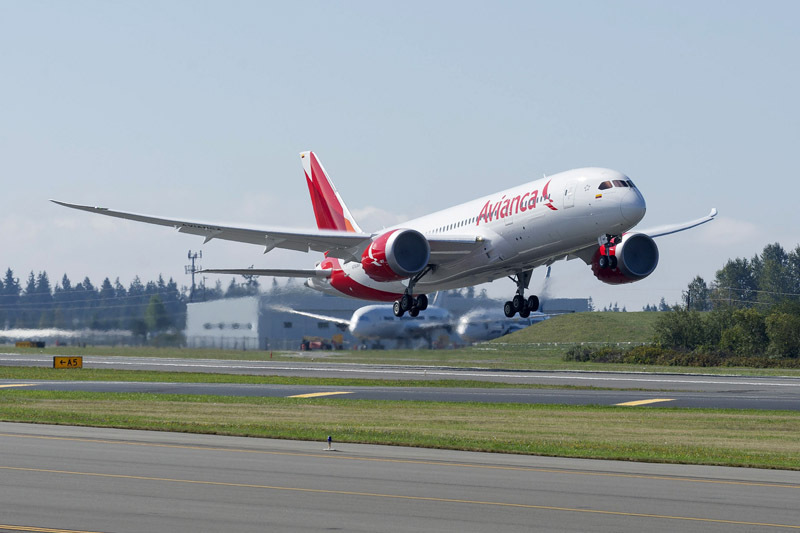 Avianca’s Boeing 787-8 will carry 28 passengers in business class and 222 in economy class. Passengers in both classes will also experience cabin environment improvements made possible on the 787 such as dynamic LED lighting, the largest windows, bigger overhead bins, a lower cabin altitude, a more humid environment, low interior noise, cleaner air and a smoother ride. With 95 years in operation, Avianca is working to fly a younger fleet than ever, flying with leading-edge technology to 24 destinations in Colombia and 98 destinations in South America, North America and Europe. To date, 58 customers have ordered 1,055 787s, making the Dreamliner the fastest-selling twin-aisle airplane in Boeing history.